You are currently browsing the category archive for the ‘Dana’ category. We talk a lot about seasonal eating here at Spark. During the winter, I like to eat hearty soups and stews, but come spring and summer, my palate naturally craves salads. I absolutely love salads, but sometimes they can get a little boring. So, another eating philosophy I like to think about is eating by color. To spice up my salads I make sure there are as many different seasonal colors as possible. Why eat by color? It ensures you’re getting a variety of different nutrients. 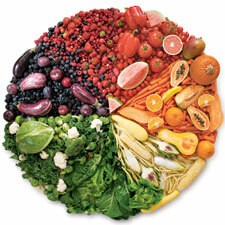 Research shows that different colored fruits and veggies offer different and essential nutrients. My favorite salad ingredients by color are: green spinach and avocado, yellow corn and bell peppers, purple cabbage, red bell peppers and strawberries, and brown almonds. During the summer, I eat a salad almost every day, so it’s nice to have a wide variety of ingredients to choose from. Beets, blackberries, blueberries, blue corn, cherries, cranberries, many varieties of figs, grapes, grape juice, plums, pomegranates, prunes, purple passion fruit, red apples, red cabbage, red pears, red wine, strawberries Anthocyanins, ellagic acid, vitamin C, fiber, quercetin (in red apples). May help prevent heart disease (by inhibiting blood clot formation); protects brain cells against oxidative stress, a tissue-damaging process associated with Alzheimer’s and other neurodegenerative disorders; keeps carcinogens from binding to DNA. What other foods can you think of for each color category? Have any colorful salad recipes to share? This spring has been super busy for me! Between working and finishing college, I’m also trying to eat well, teach yoga, practice yoga and keep my friendships healthy. Life is always this delicate act of living in the balance of things, but lately it’s been a little difficult! Here at Spark! we all talk a lot about our inspiration and motivation…the ways we convince ourselves to get up and keep moving. Lately, my yoga practice (which I hold very dear and really cherish) has been feeling more like a chore than a joy. So I decided to mix it up a bit. When I’m practicing in my yoga studio or in my home, I often find myself looking longingly out the windows at the beautiful spring weather. 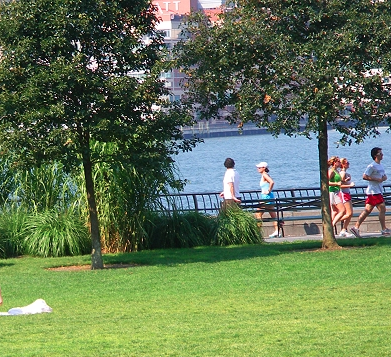 So last week I decided to take my myself down to the Hudson River Park, find a grassy spot, and practice. I didn’t have any expectations about how long I’d do yoga. I also purposely didn’t bring a mat or towel. It was great to feel the grass and the dirt on my hands and feet. We spend so much time worrying about being clean…but for a second it was refreshing to feel the soil as I stood up into Warrior I or did a Sun Salutation. It really got me thinking about the concept of staying grounded. Living in a concrete jungle like New York, it’s easy to forget about nature. But even with the traffic whizzing by behind me, I forgot for a moment about the city. So…when was the last time you walked outside barefoot? Felt the grass under your feet? Felt a connection to the earth? Spring is in full bloom here in New York City, and so are my allergies! The trees are flowering and producing lots of pollen, which can cause allergy flare-ups and sinus problems. You’ve probably seen Neti Pots in health food stores like Whole Body, on Oprah thanks to Dr. Oz and now even in the pharmacy section of your local Duane Reade. The method is actually an ancient ayurvedic yoga cleansing tradition from India meant to prepare the body for a yoga practice. Today, anyone can see the benefits from this simple daily routine. Now your first reaction to nasal irrigation might be “EWWW! You want me to put saline water where? !” But a teacher once explained Neti to me like this: we brush our teeth, wash our face, why not clean our sinuses? Neti keeps the sinuses clean and makes breathing easier and much more free. It can significantly reduce allergy problems and keep sinus pressure at bay. And, despite initial reactions, it is simple, painless, and easy. Ready to try? Visit this website for a step-by-step guide. It really is much easier than it initially seems. Have you ever tried? 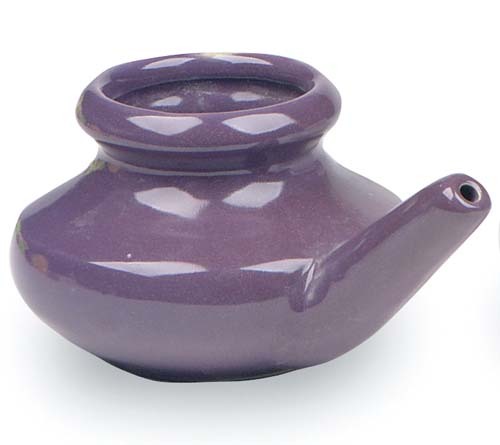 Do you Neti regularly? What are your thoughts? I’d love to hear…leave me a comment! I took a brisk walk through Central Park this morning to watch the St. Patrick’s Day Parade with some friends. What a beautiful day! The streets were filled with revelers dressed head to toe in every shade of green as Bag Pipe musicians and Irish step dancers made their way along the parade route. Even if you’re not Irish, celebrate today with a healthy take on a traditional Irish recipe. 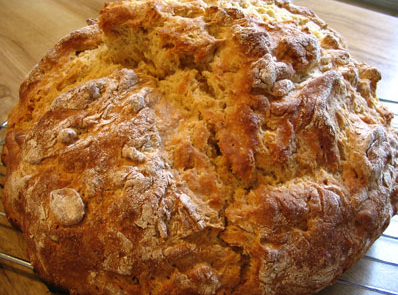 I found a few interesting recipes here on Eatingwell.com and decided to make this simple Whole Wheat Irish Soda Bread. I’m going to pair a slice with a spinach salad to make sure I get my greens for the day! Preheat oven to 450°F. Coat a baking sheet with cooking spray and sprinkle with a little flour. Whisk whole-wheat flour, all-purpose flour, baking soda and salt in a large bowl. Make a well in the center and pour in buttermilk. Using one hand, stir in full circles (starting in the center of the bowl working toward the outside of the bowl) until all the flour is incorporated. The dough should be soft but not too wet and sticky. When it all comes together, in a matter of seconds, turn it out onto a well-floured surface. Pat and roll the dough gently with floury hands, just enough to tidy it up and give it a round shape. Flip over and flatten slightly to about 2 inches. Transfer the loaf to the prepared baking sheet. Mark with a deep cross using a serrated knife and prick each of the four quadrants. Bake the bread for 20 minutes. Reduce oven temperature to 400° and continue to bake until the loaf is brown on top and sounds hollow when tapped, 30 to 35 minutes more. Transfer the loaf to a wire rack and let cool for about 30 minutes. I’ve been craving something sweet, but I’m also trying to cut down on my sugar and chocolate intake. These Carrot Cake Cookies are amazingly delicious, low in added sugar and full of healthy ingredients. I made them for a holiday party at my yoga studio last year, and the response was overwhelming; they were gone in 10 minutes! So on this rainy Sunday, I’ve decided to whip up a batch of cookies and share with my friends. Preheat your oven to 350 and grease cookie sheets. In a large bowl, cream the butter and brown sugar until smooth. 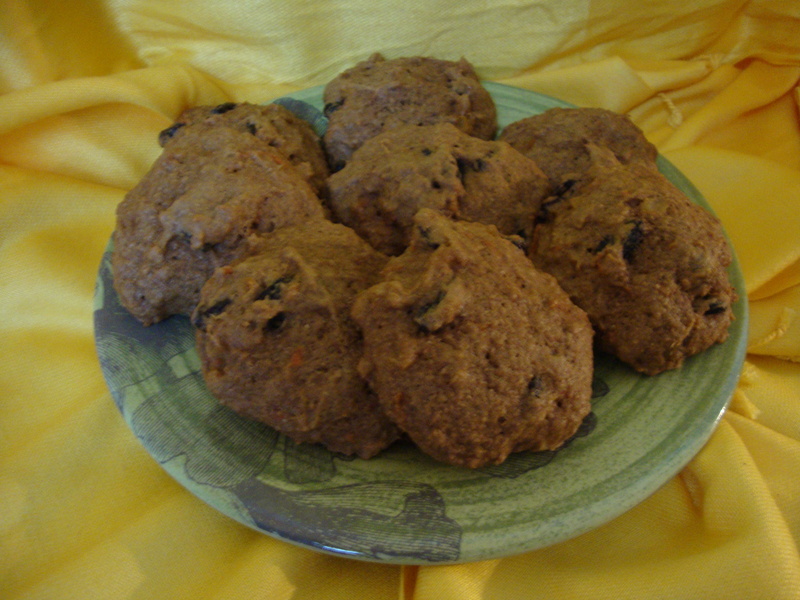 Beat in the eggs one at a time and add the crushed pineapple, carrots and raisins. Combine the flour, baking soda, baking powder, salt and cinnamon to the carrot mixture. Stir in walnuts. Drop the batter by spoonful onto the baking sheets. Bake for 15 to 20 minutes until the bottoms begin to brown. Let cool and the cookie sheets for a few minutes and then move cookies to a cooling rack to cool completely. Makes about 3 dozen cookies. Try this recipe and let us know what you think! How did yours come out? Have any better vegan substitutes? How about a sugar substitute? Leave me your comments!